Alfred Hitchcock’s last big critical and popular success was The Birds. This 1963 apocalyptic chiller was shown at the Michigan Theater on Sunday, August 6, 2017 as part of its Hitchcock Goes Hollywood series. By a fun coincidence, that same weekend the Decades television channel was showing a marathon of The Alfred Hitchcock Hour, which was in its original run when The Birds was released. I watched episodes of the TV series both before and after seeing The Birds. This combined experience helped me better appreciate the large impact that Hitchcock had on popular culture. Hitchcock is best known for the many classic movies that he directed over a 50-year period from the 1920s to the 1970s. But most people probably associate his personal image with his television anthology that was broadcast as a half hour show (Alfred Hitchcock Presents) from 1955 to 1962, followed by hour-long episodes in The Alfred Hitchcock Hour from 1962 to 1965. There’s the playfully haunting theme music that opened and closed each episode. Hitchcock introduced each episode with a deeply intoned “Good evening,” followed by cleverly deadpan commentary about that week’s episode. The simply drawn silhouette that was featured in the show’s credits became a famous symbol of Hitchcock. 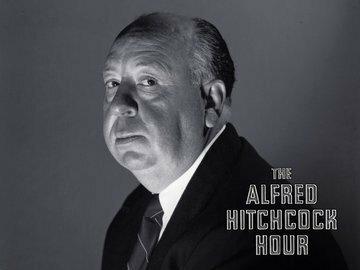 Each episode of The Alfred Hitchcock Hour that I saw featured a famous movie actor or actress at many different stages of their careers. In one episode, James Caan—years before Sonny Corleone—tried to get background for his writing by joining a youth gang, and got into more trouble than he expected. The television shows pushed the boundaries of violence for that medium the same way that movies like Hitchcock’s Psycho tested the limits for that art form. The Hitchcock Goes Hollywood series was part of the Michigan’s annual Summer Classics Film Series. The Hitchcock series focused on his post-1940s work with such well-known movies as Strangers on a Train, Rear Window, and Vertigo. The series also made room for the lesser known The Wrong Man (1956), which I saw for the first time anywhere at the Michigan on Tuesday, July 25. This real-life drama starred Henry Fonda as a falsely accused robber. It is one of Hitchcock’s less acclaimed films, but discovering it on the big screen of the Michigan was a compelling experience. Its simmering black and white cinematography made you feel the tension and helplessness of Fonda’s situation. Another highlight was the humanly real acting of Fonda, his wife Vera Miles, and their lawyer Anthony Quayle. I earlier wrote about The Birds in 2006 (Trapped on the Big Screen) and 2012 (Tippi Now and Then). Its accumulation of dread and terror has been sending shivers up my spine for more than 40 years, after first seeing it on television. The Birds was followed two days later at the Michigan with Marnie (1964). These two movies starred Tippi Hedren, who Hitchcock discovered and later pressured romantically. Marnie was the last movie in the Hitchcock Goes Hollywood series. But the Michigan will be serving up more Hitchcock on Labor Day, when it welcomes back University of Michigan students with the 1960 thriller Psycho. This entry was posted in Michigan Theater. Bookmark the permalink.